Washington (CNN) - Newt Gingrich said he was ready to "take the heat" for backing limited amnesty for longtime illegal immigrants. The heat came quickly. Top rivals for the Republican presidential nomination immediately labeled the former House speaker's stance as outright amnesty - a virtual swear word to many GOP conservatives. As seen through the eyes of "We the People".. 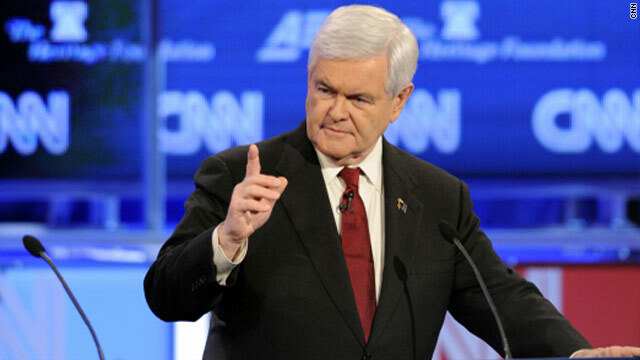 Conclusion:..........Cain/Gingrich....Ticket a winning comination for 2012..! "It's important for us to unify the country by having an honest conversation, not just a series of slogans." This is the same person that a couple of days ago labeled the Congressional Budget Office as a "reactionary socialist institution." And this is supposed to be the smart Republican? Does the word hypocrite even come close to covering this nonsense? This was a huge gamble or he has thrown the bomb waiting to see whether it will detonate. Though some say he is intelligent, but that was not a wise thing to do. He was not asked at all to give his opinion. Nothing is worse than testing anyone's thinking. The outcome might bring regrets to him. one of the current oxymorons is "compassionate conservative" you can NOT be both and I think Newt might find that out with his party. There is little middle ground for such issues there as Rick Perry found out once he took his stand on instate tuition for children of illegals and his poll numbers started to drop. Moderate Republicans that show the least bit of empathy are called RINOs by the Tea Party and the far right. Newt may have to do like Perry tried to do and backpeddle on this one because his fellow 2012ers are going to take advantage of the anger and intolerance in their party and go after him. Very calculated. Newtered knows that the hispanic vote is absolutely key to this election and he's seeking to dampen hispanic enthusiasm for voting by Obama's ability to highlight major distinctions between himself and Newtered on the immigration issue. Conservative ideologues, Teatrolls, rednecks, bible beaters and the general flock of GOP base voters who will walk in lock step for their nominee and vote "anyone but Obama" in November 2012...it really won't matter for them by then that Newtered said some things he really didn't mean during the election about trying to be reasonable and humane on immigration reform. They know nothing of the sort will get by the GOP in the House and Senate because of states like AZ, UT, GA and the rigth wing extremists representatives they send to Congress. For independents, it might soften their view of him a little and it will, he hopes, convince hispanics not to panic about the prospect of him being elected. Moreover, since it's probably just wink wink nudge nudge strategery, it wouldn't be suprising for Newtered to do a total flip on the issue once in the WH...justifying signing some crazy anti-immigrant legislation because "it was constitutional and judged appropriate by Congress" or something...but not before he signed legislation refusing all funding for all adult public school janitors and mandating that disadvantaged children clean the school toilets. You might be right. Conservatives seem to have developed a preference for Koch/Cain and the mind of Newt. Moreover, since it's probably just wink wink nudge nudge strategery, it wouldn't be suprising for Newtered to do a total flip on the issue once in the WH. I can see him justifying signing some crazy anti-immigrantion legislation with something vapid like "it was constitutional and judged appropriate by Congress" or something. Of course, that would be after his number 1 big ticket campaign promise of signing legislation repealing child labor laws and funding for all adult public school janitors and mandating that disadvantaged children clean the school toilets isntead. As always with the Newt , calculating,positioning,lying thru his teeth!! He is no dummy!! Say what he has to to sooth the middle for the general election! He thinks....I ment knows the teapubs can't stand Romney,Cain is no real problem,no one else is close!! So start planting seeds,when facing Obama he needs Hispanics,can't win without them...not getting the women's vote or the black! !